1971 is a 2014 American documentary film and the directorial debut of producer Johanna Hamilton, who also co-wrote the film. 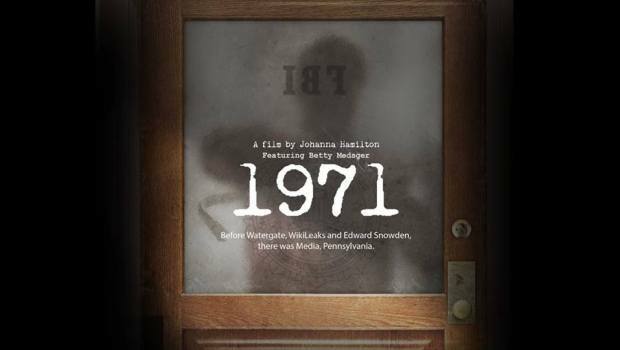 The film had its world premiere on 18 April 2014 at the Tribeca Film Festival and focuses on the break-in of an FBI office in Pennsylvania in 1971. On 8 March 1971, the night of the legendary boxing match between Muhammad Ali and Joe Frazier, eight ordinary citizens broke into an FBI office in Media, Pennsylvania. The members of the self-proclaimed Citizens’ Commission to Investigate the FBI picked the lock on the door, took every file in the office, loaded them into suitcases and walked out the front door. Mailed anonymously, these documents started to show up in newsrooms, unleashing fierce debates on whether or not to publish them. Despite demands by the Nixon administration to suppress the story, The Washington Post went to press, uncovering the FBI’s vast and illegal regime of spying and intimidation of Americans exercising their First Amendment rights. For the first time, the members of the Citizens’ Commission come forward and speak out about their actions. Through a combination of exclusive interviews, rare primary documents from the break-in and investigation, national news coverage of the burglary and dramatic reenactments, filmmaker Johanna Hamilton tells the story of the Citizens’ Commission. This is a story with haunting echoes to today’s questions of privacy in the era of government surveillance. After the Screening the expert of the Institute for Development of Freedom of Information (IDFI), Ucha Seturi, will talk about the issues raised in the film and their importance for the Georgian context. After the talk the audience will have an opportunity to participate in the discussion. Тhe film will be screened in English, with Georgian and English subtitles.